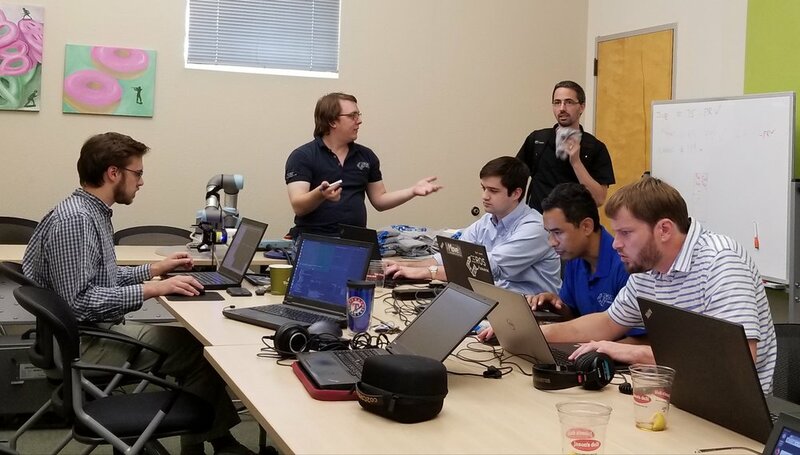 During the first week in March a ROS-I training event was held at the Southwest Research Institute campus in San Antonio, Texas. As per recent tradition, both a Basic and an Advanced track were offered. However, the Advanced track did not have any registrants, so only the Basic was held. This however, was still a milestone of note as it was the first training class in ROS Melodic. Students were guided through a number of exercises, such as; “how to create a simple urdf” and “transforms using TF”. A significant amount of work went into getting the materials for the training, including all the exercises to work properly in Melodic. Day 2 focused on motion planning introduction and exercises that introduced the cartesian planner Descartes, and a high-level introduction into Perception. The final day of the training was a lab day, where various exercises were completed, and students could test their application on the available hardware. Feedack to date was that the training functioned well, and issues were limited. In addition to the training being on ROS Melodic, a new training module was created, and though it was part of the "Advanced" topic, that was not held, I wanted to take a moment to introduce and drive awareness for a new functional demonstration. This demonstration titled “Optimization Based Path Planning”, seeks to provide users with a full working example that enables those interested in optimization of motion plans, to leverage the tools within the newly released package TrajOpt. The exercise steps through several steps leveraging template code, understand the procedure for building a problem and adding costs, solving for a trajectory, and then move to a real sensor and an actual robot leading to successful demonstration execution on hardware. 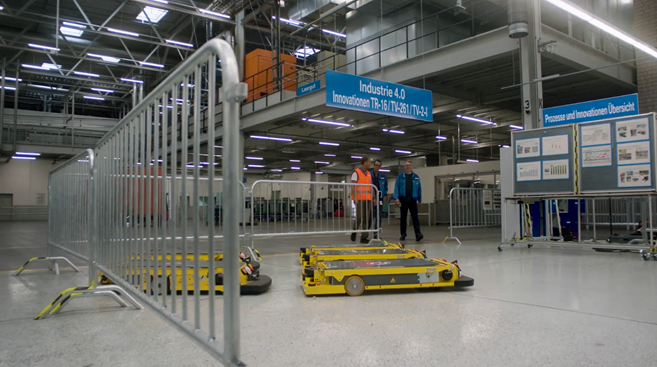 This exercise, with full demonstration environment, is open source and included over at the ROS-Industrial training website. We look forward to conducting this Advanced topic in future ROS-I Consortium Training offerings and hope in the interim that this demonstration becomes a useful tool to those interested in exploring optimization based path planning. Please keep an eye for additional improvements to the training materials and demonstrations, including new exercises and demonstrations around topics such as a ROS-I introduction to ROS2, where relevant considerations will be included to enable interaction with path planners, and realizing robot motion. As always if you have questions about ROS-I Consortium training and are curious about upcoming events, nad their locations, please do not hesitate to contact us, or start a conversation over at https://discourse.ros.org/c/ros-industrial. MoveIt has been in beta since 2013 (6 years), but today we’re excited to announce MoveIt is all grown up. We are releasing MoveIt 1.0 for ROS Melodic. What does this mean for you? The MoveIt maintainer team is moving towards clearer release schedules with better understood API breakage rational. Notably, we are now doing all our development in a master branch rather than the melodic-devel branch, etc. This will allow us to add exciting new features, even if it means we have to break API in certain areas and refactor the code to support new motion planning paradigms. See my Open Letter To MoveIt Community for more reasoning. It also allows us to break ground on MoveIt 2.0, which will provide support for the exciting ROS 2.0 framework. The port of MoveIt to ROS 2 has already begun, as described in this recent blog post. For a full roadmap of MoveIt versioning, see the MoveIt 1.0 release plan. What’s New In MoveIt 1.0? There have been lots of new features being added to MoveIt the past year that we’re really excited about. Beyond features, a ton of code cleanup has occurred (clang-tidy, catkin lint) and we have a lot more code coverage. For more info, see Migration Notes. MoveIt is a vibrant open source community with a rapidly improving codebase. Our maintainer team is awesome, particularly Robert Haschke and Michael Görner, both hailing from Germany. We’ve had 158 contributors to date that have made MoveIt 1.0 possible. We’ve come a long way from the early days of MoveIt at Willow Garage. MoveIt is now a huge international effort with contributors from research labs and companies around the world. 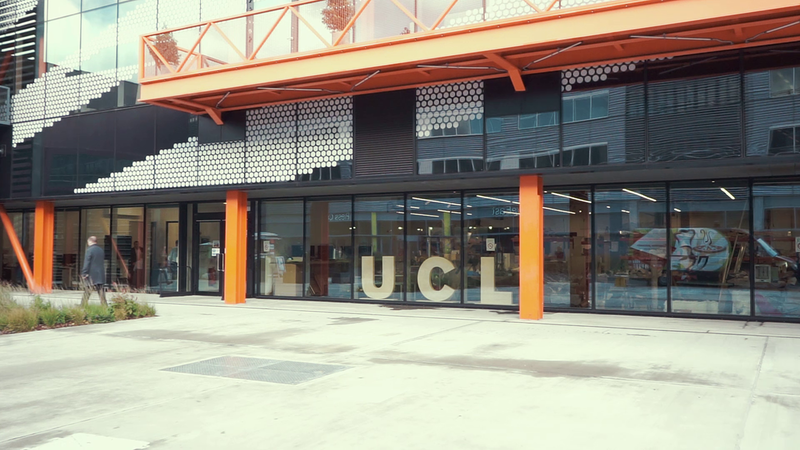 See our 2017 montage for some of the impressive applications using MoveIt. Under PickNik Consulting’s guidance, we’re encouraging more people to get involved – including you! Our third year of World MoveIt Day had approximately 310 participants from 13 locations around the globe. Together with Open Robotics, PickNik sponsored three Google Summer of Code students to work on MoveIt last summer. We’ve also put in a ton of effort making MoveIt easier to use, from the MoveIt Setup Assistant 2.0 to new tutorials using the Franka Emika Panda robot. We hope MoveIt 1.0 continues to support the worldwide open source robotics effort and the ideals of ROS. 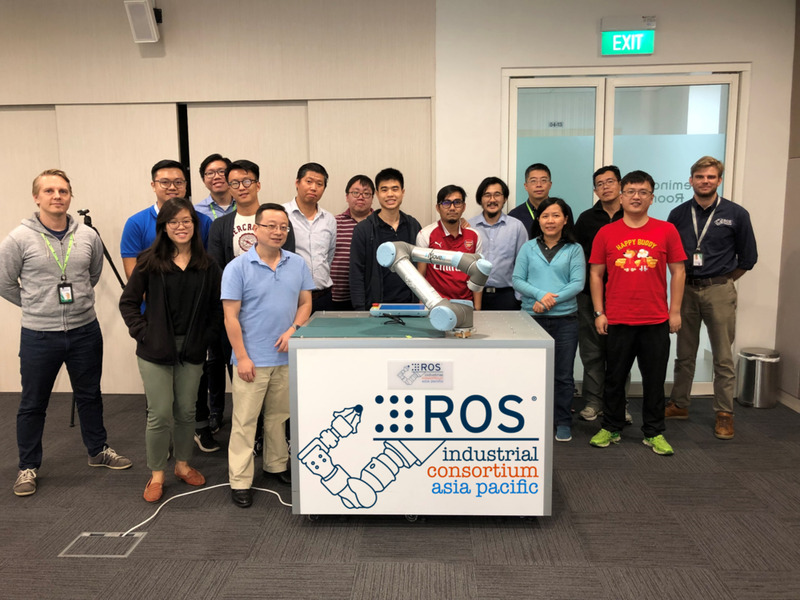 ROS-Industrial Consortium Asia Pacific, supported by Southwest Research Institute, has now trained more than 100 participants on ROS since its start in 2017! On 11-13th December ROS-Industrial Consortium Asia Pacific conducted a Basic course on ROS, at the Advanced Remanufacturing and Technology Centre, Singapore. It was followed by an Advanced topic course on the 14th December. 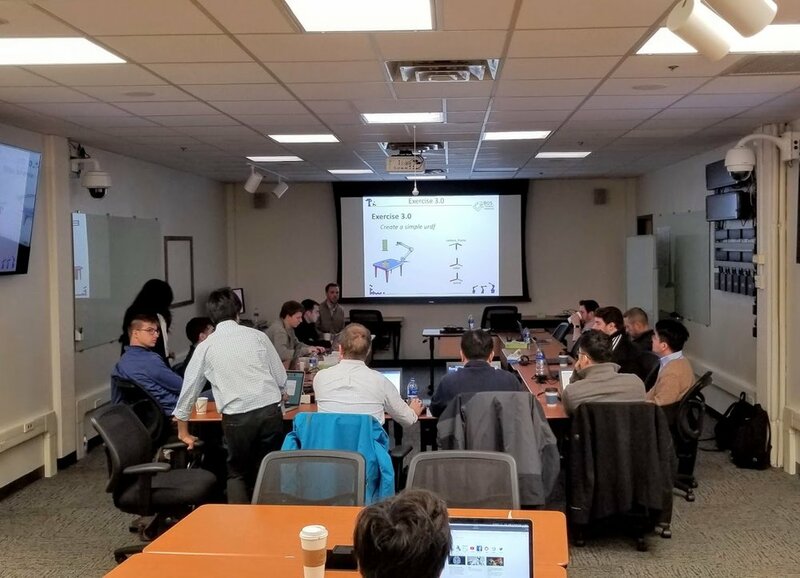 The workshop was led by Dr. Joseph Polden, and the full class of 15 participants was first introduced to the fundamental concepts of the ROS architecture and package ecosystem, followed by hands-on exercises in motion planning and perception. Thank you again for those of you who participated in this round of training! Please reach out to ROS-Industrial Consortium Asia Pacific (ros-i_asia@artc.a-star.edu.sg) if you have interest in signing up for our upcoming ROS training events in 2019! From public funding opportunities to the latest technologies in software and system integration, the combination of robotics and IT to hardware and application highlights: This year's ROS-Industrial Conference 2018 offered a varied and top-class programme to more than 150 attendees. For the sixth time already, Fraunhofer IPA organized a ROS event in Stuttgart to present the status of ROS in Europe and to discuss existing challenges. Day 1 - Session "EU ROS Updates"
The topic of open source software for robotics was present in the media throughout the year, and announcements that companies such as Google, Amazon and Microsoft would rely on ROS made waves outside the community, too. In addition, there is a booming robotics market. Martin Hägele (Fraunhofer IPA) highlighted this in his opening talk based on current market figures and areas of application for industrial and service robotics. In this respect, it is not surprising that politics and research funding on a national and international level are becoming increasingly aware of ROS. The speakers on the first day of the conference presented the projects and activities currently underway here. Applications for FTPs can still be submitted until 2020. The next cut-off date is April 5th 2019. All information on the short application process can be found here. A decisive criterion: The project provides funding for developments for which there are concrete market requirements. For this reason, the project finances one third of the software development and the applicant takes over the other two thirds. For Pilz, “Industrial Trajectory Generation for MoveIt!” was granted: Most industrial robot manipulators supported in ROS come with a MoveIt! configuration. The Motion Planning plugin for RViz allows simple and visualized planning and execution of free-space motion. Planning and obstacle avoidance work mostly out-of-the-box. This FTP addresses Cartesian motion: existing libraries for Cartesian trajectory generation lacked a user-friendly interface. The FTP implements a trajectory generator with a MoveIt!-interface for easy planning and execution of Cartesian standard-paths. In addition, the blending of multiple sequential motion commands is realized. For Nobleo Projects, “Full Coverage Path Planning and Control“ was granted: Many robotic applications need to plan a path that passes over all points of an area or volume of interest while avoiding obstacles. As soon as a path is planned, the next challenge is to control it. As neither ROS, nor ROS Industrial are currently providing needed packages incorporating this (complete) coverage path planning or trajectory tracking functionality, this FTP proposes to develop, verify and validate these packages. For PPM, the FTP “ROSweld” was granted: It develops an innovative ROS based framework for planning, monitoring and control of multi-pass robot applications with an intuitive, user-friendly GUI. The framework is built upon components from the project partners’ previous research and existing ROS modules. ROSWELD is demonstrated by the case study in heavy, multi-pass welding. For Roboception, the FTP “Visard4ROS” was granted: Visard4ROS will provide a ROS interface to fully exploit the capabilities of the rc_visard sensor and to easily integrate it into robotic products or research platforms. As part of the process, Visard4ROS will also provide documentation for integration of sensors with standard industrial interfaces such as GigE Vision and GenICam, plus examples and good practices for using separate libraries to build ROS-I hardware drivers. The second goal of ROSIN are education activities. Stephan Kallweit (FH Aachen) and Jonathan Hechtbauer (Fraunhofer IPA) presented the two formats with which the project conveys ROS knowledge. One of them is the ROS-I School. It addresses university students and young professionals to get an entry to the ROS-Industrial eco-system. Its teaching concept consists of seminars, tutorials and workshops. 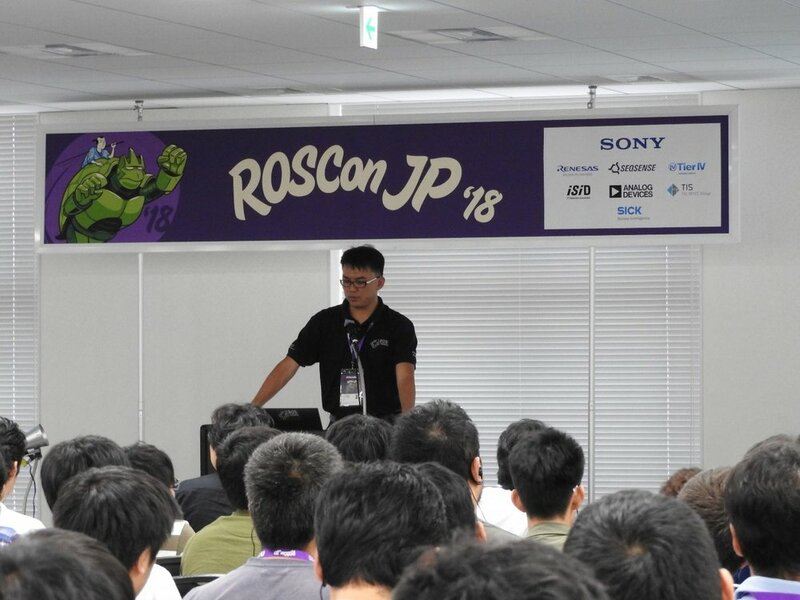 In addition, ROSIN has founded the ROS-I Academy. It consists of a ROS-I certified engineer program to assess certain skills within the ROS-Industrial software engineering eco-system. The certified skills comprise basic knowledge in ROS-Industrial, skills in code review and specialised ROS-Industrial topics. Check out the website for upcoming events. The third main activity of the ROSIN project are measures and technologies to improve the quality of software. Adam Alami and Zhoulai Fu (IT University of Copenhagen) presented the ongoing steps. On the one hand, a process and supporting tools are developed for quality assurance, where the quality of packages can be measured, assigned and displayed. Furthermore, ownerships for QA practices, tools and infrastructure will be appointed. Furthermore, code review practices are going to be reinstituted and a code scanning method and tool will be implemented. A quality hub website is already online in order to create a source of knowledge for quality assurance. A source of collaboration for quality assurance offers this page. Another quality improvement measure is the automated code testing. 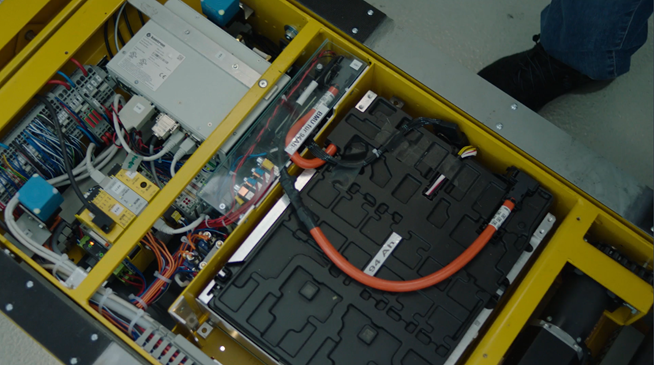 Traditional platforms are not effective enough to provide the reliability that ROS needs today as they run the same and very few test harness for many times. 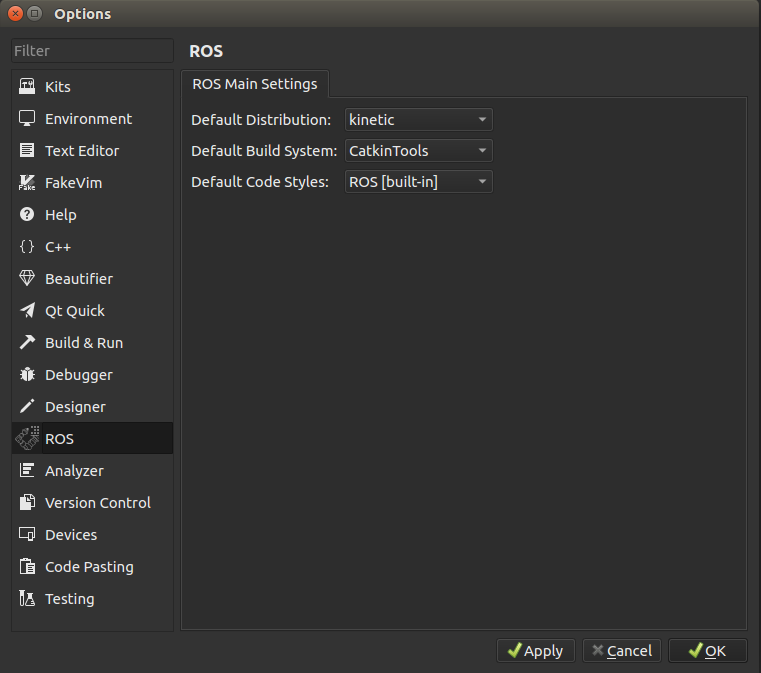 However, a ROS package is reliable, when it works as expected for all run-time scenarios. That is why ROSIN aims at developing a reliability-oriented testing framework that will be integrated to the ROS ecosystem. The conference day ended with two contributions on other research projects that also rely on ROS. Dennis Stampfer (University of Applied Sciences Ulm) presented RobMoSys. It aims at coordinating the community’s efforts to realize an industry-grade software development European ecosystem that is open, sustainable and ensures industrial quality. This shall increase the scalability and quality of robotics software development, help to commoditize base functionality, such as motion control, navigation, software components of certifiable quality and achieve predictable system integration. It addresses user requirements like, among others, reduction of development time and costs, shorter time to market and safety via a model-driven approach. Björn Kahl (Fraunhofer IPA) presented SeRoNet. This project intends to significantly simplify the design, development, and deployment of service robots in a variety of areas, from logistics, care, and healthcare to assembly support in manufacturing operations. Through an online platform, users, system integrators and component manufacturers of service robot solutions will be able to collaborate efficiently and jointly support solutions from requirements analysis to deployment. The SeRoNet platform (available from summer 2019) will bring together users and producers of robotic solutions and will create a market for service robot solutions, services and hardware as well as software components for application solutions. Both projects will publish Open Calls in 2019, for which companies involved in robotics can apply for funding. 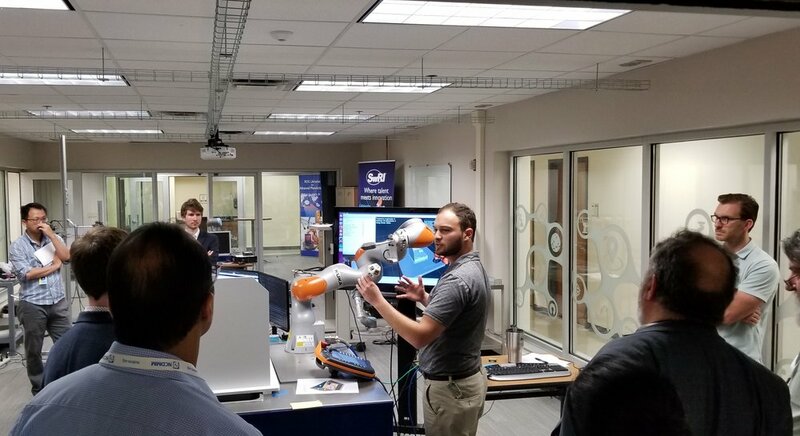 A recent conference brought together end-users, solution providers, OEMs and researchers to discuss the latest in robotic applications around grinding and surface finishing (https://www.robotics.org/robotic-grinding-and-finishing-conference). It was an eye opening event and the first of its kind to focus on automation for these types of processes. While there are many conferences on automation, the topics of surface grinding and finishing are rarely at the top of the topic areas. This event also underscored how there are few specialists in this area. The first panel of note discussed whether to automate these operations and how to understand if there was benefit in attacking what is typically considered manual work. There were a number of assumptions that went into the approach, but we learned quickly there was a lot of interest as this was an audience that has historically struggled with legacy approaches and hardware in automating such operations and processes. Charles Gales of Weldon Solutions Presents on Automating of Complimentary Processes as a means to introduce surface finishing to your operations. The sessions’ two main points were: automate as you can, such as complimentary processes (capture more work with that automation investment), understand your process and burden, and be cognizant of the fact of how you do it a certain way manually today doesn’t mean that will be the most optimal way to execute your process robotically. Force control was the next panel that gained a lot of attention. Obviously, force/torque sensing in a number of areas has become an area of active robotic interest in traditional automation applications and of course applicable in surface processing. There were introductory conversations about the types of force control, such as the pros and cons of passive versus active. A number of compelling applications leveraging active force control were featured. ATI, PushCorp and FerRobotics all offer approaches to meet a wide array of client needs and applications. ATI, PushCorp, and Fer Robotics participate on a panel discussing force control in surface finishing and grinding applications. Near the end of the day was an additional panel around DIY Integration, which was incredibly eye opening and generated a lot of conversation. The panelists – Brandon Berth, from Kohler, Matt Morrison, from Marshalltown, and Scott Harms, from MetalQuest – shared interesting stories about making progress on their automation journey through trial and error and developing their own in-house skills to manage deployments. These were stories that relied on a commitment and a process; starting small, developing the skills and gradually moving to more complex applications. The second day started off with Kuka presenting on enabling small and medium enterprises to take on grinding application development. The key tool they demonstrated was the ability in their simulation ecosystem to empirically model the sanding process and highlight the path and planned surface contact and subsequent material removal. This provided a very compelling visual assessment for the grinding process as it is being developed in their off-line environment. The next two presentations were very interesting as they showcased two competent integrators in the space. What was evident, even though their core expertise varied, was that they relied heavily on the teach pendant and skilled online programmers to really bring the process over the finish line. Much like the prior presentations, or the presentations by the DIY’ers, here again we were relying on skilled technicians and industrial robot programmers to complete the implementation of the automation. The level of variation management is limited due to the nature of the deployments. Also, for some of these applications, it may not be realistic to enable too much flexibility as the broad array of complex surface finishing applications was impressive. I had the opportunity to talk about ROS-Industrial and the work that has been going on in surface finishing using perception and advanced path planning and process planning techniques. This space has talked about path planners (Trajopt!) and applications (Robotic Blending, A5 and undergrads using these tools), so I won’t get into those details here, but two thing are evident. There is a need to change how we approach these processes if we want to truly attack these types of applications. We can’t rely on skilled robot techs to have a teach pendant in-hand. Not every company can grow that expertise in-house over years. Even if they do, how do they scale beyond their core facilities? The first UK edition of the ROS-Industrial Training took place last week hosted by re.je at UCL Here East 5 - 9 November 2018. The target is to boost participants from industry with little or no ROS knowledge to a level with broad comprehension of the robotic framework. The theoretical content is consolidated with workshops and is applied on simulated and physical mobile and industrial robots. The next edition of the training will take place in Q1 2019. Please watch the re.je, ROS-Industrial and ROSIN websites for more details. 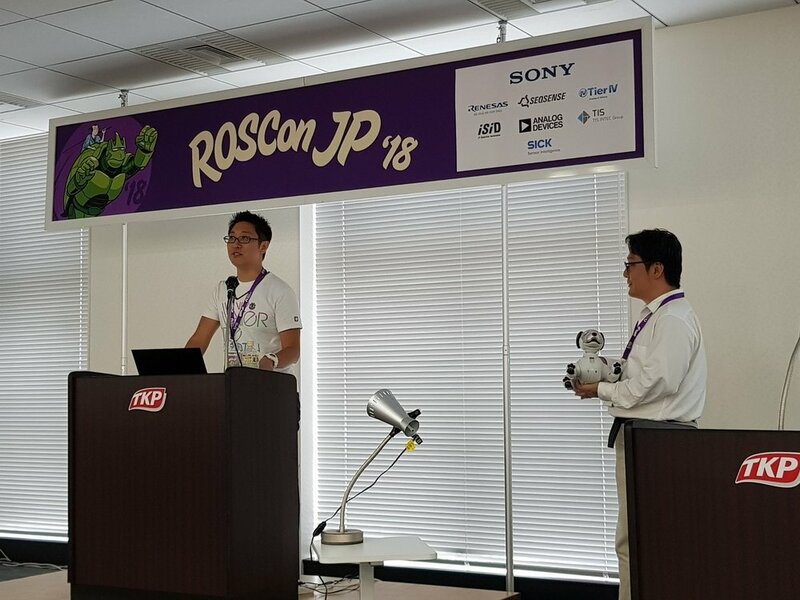 The first ROSCon JP opened in Tokyo on Friday, September 14, 2018 with much anticipation. It was an amazing sell-out crowd with 200 participants from the community. ROS-Industrial Consortium Asia Pacific was honored to participate and present our efforts in the industrial space to the conference attendees. 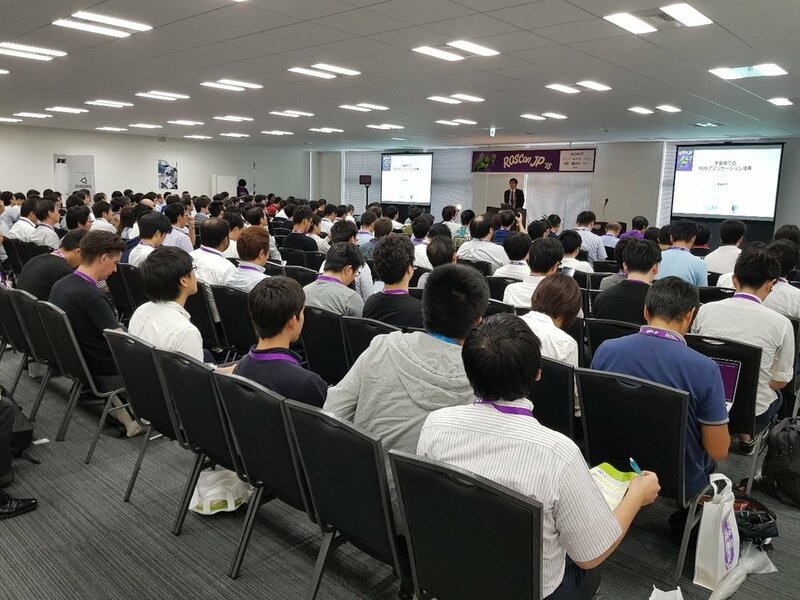 The one-day event was not dampened by the early morning rain and the room was quickly filled up with excited participants to hear the keynote speech from Brian Gerkey (CEO Open Robotics) and various prestigious speakers from industry, such as TORK, JAXA, Toyota Research Institute, Honda Research Institute, Hitachi and various universities. Brian’s speech envisioned how ROS2.0 will be designed to address the future needs of industry and commercial users. This is extremely important to us as an anchor for our work in the ROS-Industrial Consortium and will soon prove its value in our development work. Our presentation looks through the lens of Asia Pacific as we started our journey for ROS-Industrial and what challenges were faced in developing the communities in the region and the need to gain their confidence and trust on using open source software. 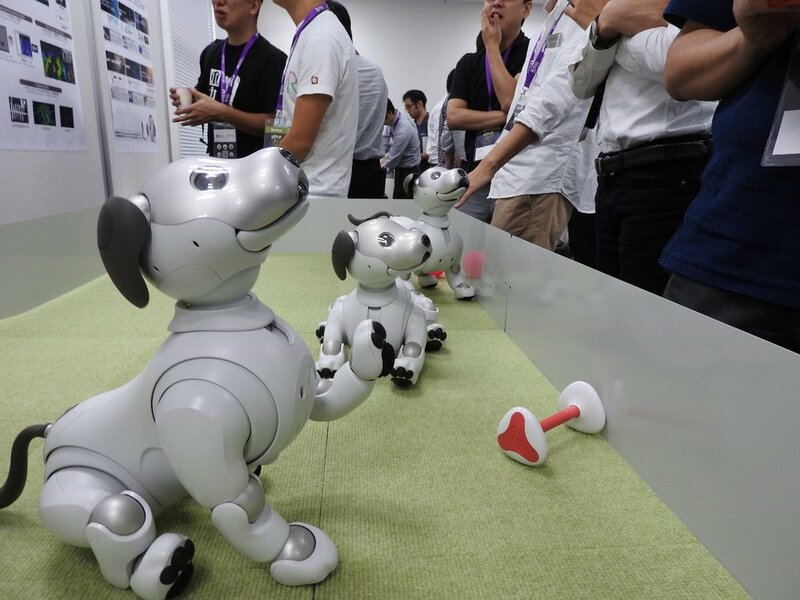 The most highly anticipated talk was nevertheless from Sony Corporation and their ‘kawaii’ robot dog – Aibo. The generation 2 Aibo is running on ROS with Amazon Web Services. Sony has made a significant stride to shift from internal proprietary solution to embrace open source. The crowd was amazed by the demonstration by Sony Corporation. The event has demonstrated the passion and interests from the Japanese communities. It is very exciting to feel from the community that ROS will continue to evolve and adopted in the coming years. I like to thank the executive committee team (Jeff Biggs, Egashira Hirokazu, Yukiko Nakagawa, Yutaka Kondo) for organizing this wonderful event. I will be looking forward to the development of ROS in this Community. The ROS-Industrial Consortium - Asia Pacific will continue to explore how we can strengthen and develop the ecosystem with our Japan partners. The ROS-Industrial global community organized and pulled together the first World ROS-I Day, inspired by the successes of World MoveIt! Day, but focusing on the repositories relevant to ROS-I. We had five sites signed up to host, and we meet up in virtual collaboration rooms as well. The event kicked off from Asia, led by our friends at ARTC in Singapore, ROS-I Asia-Pacific, handing off to the EU, hosted by Fraunhofer IPA, then finally to the Americas, hosted by SwRI’s ROS-I Team located at LiftOff, thanks to PlusOne Robotics, in San Antonio, Texas. The Asia-Pacific team was joined by a team based in Delhi, India, and the U.S. team was also joined by the Open Robotics team in Mountain View, California. Though these were the meet ups that we were aware of, there were a number of additional teams and individuals that contributed, and the ROS-I developing teams have been happy to see the level of engagement, and hope we can maintain this level of participation moving forward. We were excited to get to work and do some clean up with the ROS-I teams on the various repositories and packages, working on a predefined list of issues. 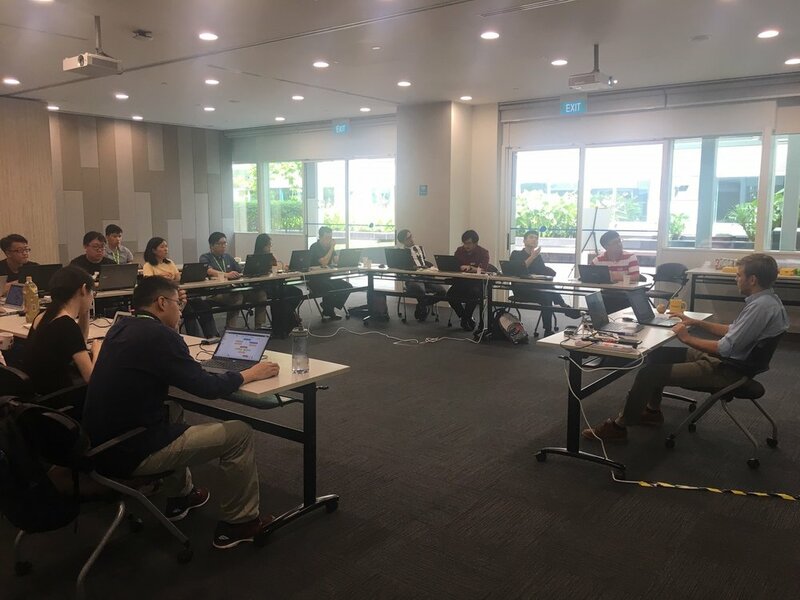 The ROS-I development teams started with a list of repositories as the focus of the inaugural World ROS-I Day on July 11. This enabled for making of a manageable scope and allowed for tracking of progress throughout the day. The maintainers worked up reviewing the repositories and classifying the issues and including them in an issue board. This really enabled the organization and workflow for the event. We had designated assigners for issues and leveraged an IRC chat room to do assignment of issues and enable efficient communication for remote teams. Within the rooms we had to be careful managing that we did not do redundant work. Though a few times issues were worked by multiple developers, for the most part, the event went off well considering the logistical challenges that can be encountered when working across multiple time zones around the world. Over the 22 hours that World ROS-I Day was in-flight, 31 issues were closed and there are, at this time, 16 Pull Requests to be reviewed, with a handful of assigned issues still being worked, per the issue board. Overall, the ROS-I team, and we hope all those that leverage ROS-Industrial repositories, feel this was a worthwhile and a quite successful event. Traffic statistics indicate that the repositories of interest saw sustained activity even after World ROS-I Day. Moving forward, we are working to continue the momentum. 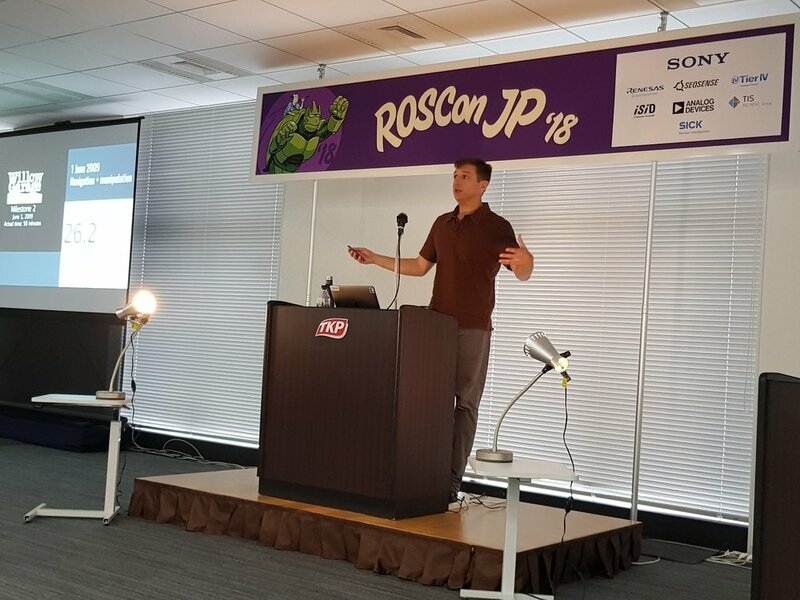 This will manifest itself in an effort to improve the monthly ROS-I Developers’ Meeting, which we have been working to socialize via the ROS-I Discourse Category at https://discourse.ros.org/t/ros-i-developers-meeting/5047/18. Furthermore, we are excited to continue our support of World MoveIt! Day this October. And, of course, we are excited to begin the planning for a follow World ROS-I Day, and are looking forward to getting the feedback from the developing community for how to make this event more meaningful and engaging. It is an exciting time in open-source software as an interest is advancing in industrial and manufacturing automation capability. We look forward to continue engaging the development community and to provide avenues for collaboration. ROS-I set out to be an open-source project to bring the power of ROS to industrial applications. Along the way, it has at times, been difficult to bring the developing community to these same applications. We hope through engagement and meaningful collaboration events, we can build that community, and we hope you look forward to laying those foundational pieces with us. Keep an eye out for updates on planning/details for World MoveIt! Day, and of course the second annual World ROS-I Day, potentially in the first quarter of 2019, but of course, we are open to timing recommendations. Thanks for your continued interest in open-source for industrial automation! The ROS-Industrial Americas consortium hosted its second training event of 2018 in Seattle on July 17-19, attended by 15 students from companies across various industries. The three-day event, hosted by Levi Armstrong and Michael Ripperger from Southwest Research Institute, featured a basic and advanced track where participants were able to explore ROS-related topics from ROS architecture and communication to motion planning, perception, and code testing. New to this particular training session was the inclusion of a Python node within the Perception Pipeline to enable the understanding of C++ and Python node interaction. Additional content around RVIZ GUI creation and debugging tools were also featured. To explore these new modules and the rest of the training content, check out the ROS-I training wiki here. 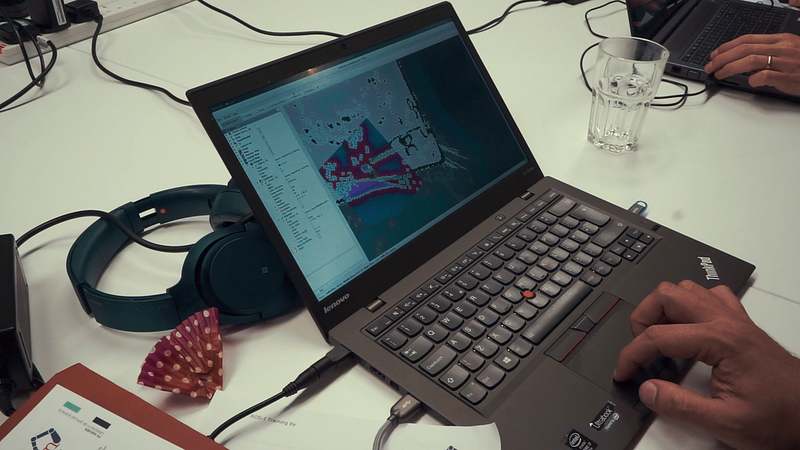 The training event was a combination of lecture and hands-on coding and hardware demos. At the end of the event, students were able to interact with provided UR5 robots and test the code they created on the robots. Overall the training was a great opportunity to learn more about ROS and network with ROS-I Consortium members, or their partners, in the robotics field leveraging ROS in their own applications. Thank you to our hosts in the Emerald City and to all of our attendees for making this class a great success. A third ROS training event for this year is currently in the works for the fall, so stay tuned for more details! Also, don't forget, full Consortium members are able to host ROS-I Consortium Americas training events, such as this event in Seattle. As always, do not hesitate to offer feedback relative to how training can be improved to meet your needs. We are always interested in member and community feedback! Nondestructive evaluation (NDE) techniques for parts and structures that are created from either forming processes or additively manufactured processes typically have had to be manually performed. Recent advances in scanning technologies and intelligent path planning tools, such as those available within ROS -Industrial, present a platform capable of performing multiple NDE processes in an intelligent fashion leveraging the Scan-N-Plan framework. The Sensors Systems & Nondestructive Evaluation team within Southwest Research®, along with ROS-Industrial developers have conceived of a concept to enable a Scan-N-Plan approach to Nondestructive Inspection (NDI) thereby reducing the amount of inspection time by only performing detailed surface or volumetric inspections where mandated by an initial higher level screening. The Sensors Systems & Nondestructive Evaluation team has developed a unique technology within their portfolio that performs full volumetric inspection using a guided wave technique that leverages an omni-directional probe. The concept would be to perform a macro-level scan leveraging the MsT360 Guided Wave Sensor, analyzing the output and for indications, or areas of interest, drive low level inspection. A sample output from this stationary sensor can be seen below. This output can then be leveraged to generate process paths for follow on inspections such as Eddy Current (EC) or Ultrasonic Testing (UT), only in the areas of interest. This provides the full volumetric inspection output, but reduces the time spent doing a 100 percent surface scan with higher resolution traditional UT. This improves solution velocity as well as reduces post-processing clean up. Based on experience with the MsT360 follow-on low level inspection techniques can be selected based on the characterized potential defect. The system would then Plan trajectories based on this scan for each process, including the stand-off or contact forces and trajectories mandated by the process. A map could be visualized and colored to aid the operator in understanding which regions will be inspected by which NDE process. In the below example for instance, a process would be planned for the area identified with the 35% wall area, or where weld 1 and 2 are located, as opposed to UT or EC of the entire volume or surface respectively. The flexibility inherent to this design and the capability included enable processing of piece-parts, such as forms, as well as fabricated structures. The macro scan and detailed path planning approach is more efficient for when it is not inherently value added to inspect an entire volume or surface area. As can be seen in the above image, specific regions can be highlighted based on an output such as described earlier, or these can be user adjusted based on a response from a developed GUI. These trajectories can be planned for all the processes of interest, in this case UT and EC, with their requirements relative to process execution included. Leveraging the flexibility of the Scan-N-Plan framework it is easy to see how NDE processes can either be included into a multi-process cell, or just automated in a manner that effectively applies them where required, or where that detailed scrutiny is most beneficial. Furthermore, this can be augmented with visual imaging to allow for assessment of human readable details , or human generated markings to drive further process planning and inspection. For future consideration as well are several visual NDE techniques for surface inspection that could be incorporated, such as dye penetrant, magnetic particle, pulsed thermography, etc.